When you look at the huge monster that is A39 Tortoise it is very tempting to draw immediate comparisons with the German tank destroyers, Elephant, JagdTiger, and JagdPanther. However nothing in WWII British Tank development is straightforward and the development history of Tortoise contains many twists and turns with its origin being far removed from what it eventually became. In early 1943 considerable thought was being applied to the preparation of men and equipment for the assault of the German forces in north-west Europe. Clearly tough resistance was to be expected with the enemy fighting from strongly fortified positions. It is against this background that a new class of vehicles, Assault Tanks emerged. The concept behind these vehicles was for maximum armour protection at the expense of mobility. Initially work was concentrated on the A33 essentially a heavy Cromwell (cruiser) and the A38 Valiant which may be regarded as a heavy Valentine (infantry tank). In addition to this there was a program to up armour the Churchill. This was pretty typical of WWII British tank development as the adopted doctrine of Infantry tanks and Cruisers invariable meant that each new design specification could be approached from two existing starting points. By Mid February 1943 the D.A.F.V. (Director Armoured Fighting Vehicle) had started drafting an updated policy for current and future AFV design. The early drafts of this policy make brief mention of A33 and A38, both as experimental vehicles and not intended for production at this time1. By the end of February the policy with regard to new projects2 included consideration of the development of another assault vehicle the characteristics of which were: a minimum of 150mm (6") frontal armour; 60% and 40% of this basis at the side and rear respectively, and a minimum of 25mm on the roof and belly plates. It was stated that "this type of vehicle would be required in a role where obstacles and mine fields predominate" and that "special attention should be paid to protection of propulsion components and floor construction". Another perhaps significant addition (which well come back to later) to the policy was for an investigation to develop a 3.7 inch gun of approximately the same external diameter as the 3 inch 17-pr as an alternative to the latter with the advantage of a more effective H.E. shell. Further clarification of the role of assault tanks comes from a Joint Memorandum by the Secretary of State for War and the Minister of Supply dated 23rd April 19433. "The development of the defensive minefield and anti-tank obstacles, in addition to the anti-tank gun, will tend to limit the use of any form, of assault tank so far envisaged, except in certain special circumstances. The anti-tank gun is ahead, and will in all probability continue to keep ahead of tank armour.... Additional armour will not get over the difficulty of the minefield and the anti-tank obstacle. .... The War Office, nevertheless, accept the view that a proportion of heavily armoured vehicles may be necessary in the assault phase of future battles, and as initial steps towards meeting this requirement, the addition of armour to the Churchill and the production of Valiant and A.33 prototypes are included in the development programme. A limited number of tanks will form a necessary part of the assault organisation, as flame-throwers, pushing snakes, utilizing their own H.E. and smoke equipment, carrying fascines for bridging trenches, and possibly towing infantry in armoured sledges. ......Thicker skinned tanks used in this manner have obviously got greater immunity, but complete immunity is not possible. In order to develop the technique of assault, the General Staff have also allotted to the 79th Armoured Division the task of studying this problem in conjunction with the Engineer Assault School at Aldershot, and of training Assault Groups composed of R.A.C. and engineer personnel, with the specific object of perfecting such weapons and devices as are at present available, and of continuing research and development into improved methods. The more heavily armoured vehicle which is envisaged for the assault role, will be developed tactically in this formation. The memo then continues to discuss the various options such as the adaptation of existing vehicles such as the Churchill and Stern tanks (TOG2 & TOG3) and then considers other vehicles under development. In order to meet the requirement of a more heavily armoured vehicle, therefore, it is proposed to proceed with the adding of armour to the Churchill tanks as indicated above as an interim measure, the development of prototypes of A.33 and of the small heavily armoured vehicle known as Valiant, together with the possible evolution of a small very heavily armoured special purpose vehicle known as the Tortoise.... The Tortoise as yet exists only as a broad idea. No design has so far been produced. The underlying idea is for a small machine of slow speed with at least 6" of armour in the front, 60% on the side and 40% on the rear, equipped with a limited armament. This memo gives us a general idea of what the original intentions were for the Assault Tank. It was designed as a special purpose vehicle to operate in heavily defended areas as part of the 79th Armoured Division. This implies only a small number of such vehicles allocated in support of other formations as required. Although vague, this specification was promptly taken up by Nuffield Mechanisation Ltd. Given that the requirement for such a vehicle only seems to have come about in February and that at the end of April was still only a broad idea, the rapidity of Nuffields involvement is somewhat surprising. Between 13/5/1944 and 25/02/1944 they managed to draft no less that 18 separate designs, each successive design being generally larger and heavier than the last. The early designs had an array of individual and combinations of armaments including multiple machine guns, flame throwers, mortars and 6lb guns. AT7 10/06/43 41.5 6-pdr with autoloader, 20mm cannon, 2 twin mg cupolas, flame thrower. * Date on design from design drawings held at Bovington. Now its important to realise that the earlier design proposals bear little resemblance to the vehicle we know as Tortoise. Indeed its not until the AT13 design that the familiar super heavy, hard-hitting characteristics start to emerge. Up until AT10 the vehicle broadly falls within the specification mentioned above, although the choice of 6-pdr as armament might be queried as one would have thought that and effective HE capability would have been preferred. This is perhaps explained by the belief that AP was much more effective as a bunker-buster than H.E. So why the dramatic change the design between AT10 and AT13? The answer comes in a letter from Sir Miles Thomas to C.A.F.V. dated 6/8/434 in which he reviews the developments up to A.T.10. He describes that original conception of Tortoise as being "a small assault tank, very heavily armoured and carrying as main armament a 6-pr gun" and implies that A.T.10 represented "what appeared to be the optimum combination of armour and armament". At his stage it would seem that Nuffield were pretty confident of the design an a wooden mock up was complete. The letter then goes on to explain how on July 9th 1943 Nuffield received notification from the General Staff that Tortoise was to mount the new 75mm high velocity gun. The high velocity 75mm gun was a development to design the most effective AT gun that could be fitted into the Cromwell  it eventually became the 77mm but despite numerous assurances proved to be impossible to mount in Cromwell requiring a new Cromwell type tank, the A34 Comet, to be designed for it. To accommodate a gun of this order meant increasing the size of the fighting compartment, and therefore the weight of the complete vehicle, until an overall weight of 65 tons was envisaged. It was then realised that there being so little difference between the space required for the 75mm H.V. gun and the 17-pr, it was decided to adopt the 17-pr gun instead. A new design study was therefore embarked upon which resulted in a draft specification for A.T.13. summarised below. Sir Mile Thomas then goes on to point out the potential problems of manufacture due to the size of the fighting compartment casting, the potential problems of transportation (road, rail and sea) and of steering such a large vehicle before asking the General Staff to consider whether they thought the advantage of the 17-pdr over the 6-pdr was worth such an increase in weight. The impression given is that Nuffield would have rather have continued with A.T.10 than embark on yet another series of designs. Width The width of the hull with the track guards removed is 11, which again meets the bailey bridge requirements. Armament 17-pr gun with 100 elevation and depression and 400 traverse. With 17-pr is a co-axial Besa. On the other side of the vehicle can be accommodated either a 95mm Howitzer giving 200 elevation and 100 depression, or a 20mm cannon. Either of these would have a co-axial Besa. On the roof of the vehicle would be a cupola with twin Besa so arranged that there is 3600 covered by Besa fire. Accommodation for 50 rounds of 17-pr ammunition is arranged. Engine & transmission The power unit is a Meteor Merritt-Brown installation fitted with an all speed reverse, giving approximately as high a speed backwards as forwards. Suspension multiple bogie wheel type, there being in all 40 (2 rows of 5 points of contact between the suspension and the tracks. These latter are 32" wide. To negotiate Bailey bridges, 5 outside bogy wheels on each side are de mountable, and a track sufficiently narrow to enable the vehicle to cross the bailey bridge (10 4" overall limit) can be provide. Ground contact There is 15 4" of track in contact with the ground. At this stage the future of Tortoise seems to have become uncertain. On the 9th August the following statement was submitted by C.A.F.V. as part of General Notes for Guidance on Tank projects not yet in production5. "The first Tortoise is the name given to the heavy assault project visualised in D.C.s (S) Paper (43) 23 dated 30th April 1943. So far only preliminary exploratory work has been done and it is by no means certain whether a practicable tank with about 9" frontal armour will emerge from this study. One proposed arrangement of the armament of this machine has been submitted to the General Staff for consideration and other proposals have been made. Until the role of this tank, and hence the armament, is settled it is impossible to state whether the project is practicable, but it is quite clear that in view of the extreme difficulty of the problem and the many novel features involved, production should not be proceeded with until a prototype has been completed and tested, and, therefore, a long period must elapse before these vehicles can be put in the hands of the troops. If the General Staff require this type of tank and would be prepared to consider machine gun armament only, the quickest and most effective approach would be from the Valiant basis." It would appear that it was not until the end of September that a decision was finally made upon the future of Tortoise. On the 24th of September a statement with regard to the long-term development policy was issued by the General Staff6. A meeting was held between the War Office, Ministry of Supply and the A.F.V. Division to propose recommendations for the implementation of this policy7. Their recommendations to meet the requirements for a super heavy tank with not less than 8" frontal armour was to proceed with a mock up and preliminary design of the latest type of Tortoise mounting 3" 17-pr or 37pr with limited traverse and auxiliary armament of machine guns. This is the earliest reference I can find that links the 37 pdr with the Tortoise. The nature of the 37 pdr requires some explanation. Back in October 1942 the General Staff had turned their attentions to finding a successor to the 17pdr anti-tank gun. The basic requirement was that the weapon should be 25% more effective than the 17-pdr. Initially focus was on the development of a 55-pdr however improvements in 17-pdr ammunition meant that it didnt offer sufficient advantage whilst providing considerable disadvantages tactically and in handling and stowage of ammunition etc. Other options proposed included a 3" 17-pdr firing composite rigid projectile core weight 4 lbs at 3,550 f.s., a 3"/2·25 Littlejohn firing a 3·5 lb core at 4500 f.s. and a 30 pdr of 3.45" calibre. The D.G. of A commenting on these options in April 43 noted that the Littlejohn was too limited by its reliance on sufficient provision of tungsten, the composite rigid and Sabot projectile should be developed further. With regard to the 30-pdr of 3.45" calibre his opinion was that it could not deliver a suitable A.P. shell, however he did suggest that a 30 pdr 3.7" might be worth investigation as it was a standard calibre and had a better margin for further improvement8. In due course the 3.7 inch A.A. gun was chosen to be adapted to the 30-pdr anti-tank gun and approval was granted in September 1943 for pilots to be built. A short time late it was proposed that a 37lb shot would give better performance and for a while the weapon was thus known as the QF 37 pdr EX1. Following firing trials in June 1944 the 37lb shot was dropped in favour of a 32 lb shot and so when finally accepted the weapon was known as a QF 32 pdr. It is worthy of note that the Tortoise was not the first self-propelled mount for the 3.7 in anti-aircraft gun as earlier Canadian experiments had been made in mounting the AA gun directly on to a Ram Tank hull however this proved to be an extremely unwieldy design. Design continued at Nuffield using the 17-pdr until December at which time a wooden mock-up was virtually complete and was inspected by D.R.A.C. At this stage it was suggested that at the projected 68 tons the tank could not be justified unless it mounted the 3·7" 65 calibre gun. This would appear to be quite a bold statement given the relatively early stage of development larger gun and is perhaps an indication that, despite Nuffields frantic design efforts, this latest incarnation of Tortoise was regarded as a long-term project. In any case the mock-up was therefore modified to take the heavier gun carried in a ball mounting and instructions given to proceed with a soft hull for the purpose of testing suspension, engine layout, transmission and general mechanical features whilst the modified fighting compartment design itself was finalised9. By February 1944 design A.T.16 was complete and met with approval from the Tank Board who at their meeting on the 23rd February 1944 proposed that 25 be produced direct from the mock up stage without waiting for trials of a pilot model. These vehicles were to be available for operations in September 1945. The Board accepted this procedure and D.C.I.G.S. undertook to obtain formal War Office approval and placing of a requirement10. By the time the board met again in May an order for 25 had been placed by the War Office and work was underway11. Clearly the A.T.16 design was far removed from the original 'requirements' of April 43 for a small heavily armoured assault tank. However, by this stage of the war the Churchill programme had resulted in a vehicle that had the specified 6 inches of frontal armour and was fulfilling many of the assault roles originally specified particularly as employed by the 79th Armoured Division. So on what basis was the Super-Heavy A.T.16 accepted? Back in April 43 Churchill himself had outlined a potential requirement for a heavy tanks or 60 or 80 tons to provide a battering ram of heavily armoured vehicles to break the enemy's front and make a hole through which the lighter vehicles can be pushed. Such tanks would be attached to Armies or possible even corps in each theatre12. As the great man said The warthog must play his part as well as the gazelle. No doubt this minute was intended as an endorsement of the efforts of Sir Albert Sterns S.V.D. Committee and their TOG designs. From early in the war Stern had, with Churchills encouragement leading a design consortium consisting of many pioneers of British WWI tank development. This group was operating independently of the Ministry of Supply concentrating mainly on the development of a heavy Infantry tank that became named TOG (The Old Gang). Despite Churchills enthusiasm the Tank Board had shown little interest in Sterns tanks and now gave acceptance to what may well be regarded as an alternative design. Once the War had ended the order was reduced and ultimately only 6 vehicles were ever built. Tortoise was sent to Germany for automotive and gunnery trials where it was found to be reliable and a hard hitting and accurate gun platform, however at 80 tons it proved to be difficult to transport and at a height of 10 feet was considered too tall. On completion of the trials the Tortoise was discarded. 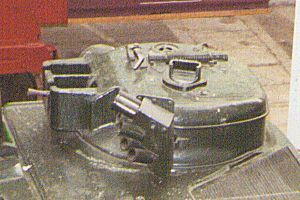 The 32-pdr gun was in a power assisted limited traverse mounting (only the very first design AT1 had a turret). 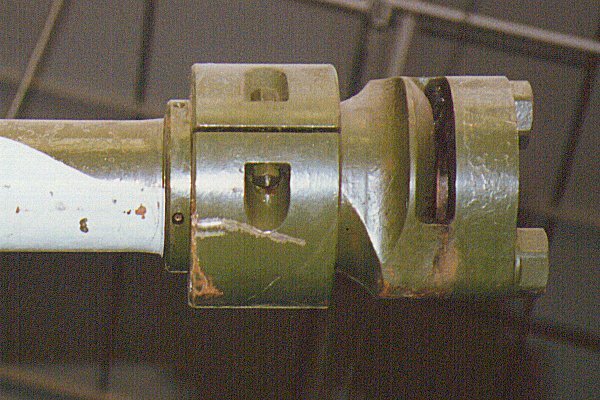 The gun barrel rather than being mounted on the more traditional trunions, protruded through a large ball mount. The ammunition for this weapon was two part with separate propellant and shell/shot and its shear weight and size required that Tortoise carried two loaders to service the gun. The Tortoise hull was divided into three compartments, the front containing the Meritt transmission, the rear containing the Meteor engine, fuel tanks and radiators, and the fighting compartment. The Tortoise had some unusual design features. The secondary armaments included a small turret mounted on top the hull which held twin Besa machine guns. The firing mechanisms of these guns had to be fitted with stops to prevent accidental firing at the hull fittings or crew hatches! The suspension consisted of four bogies on each side each containing two pairs of wheels each pair being linked to a transverse torsion bar. Each wheel could move independently from its partner and the suspension itself was said to have produced an excellent smooth ride. However the level of complication meant that there were in all over 200 separate greasing points - a maintenance nightmare! Note: Two pairs of return rollers are attached to each of the centre suspension brackets but are not shown in the above diagram. The front and rear suspension units were of a different pattern with only on pair of return rollers and shock absorbers mounted on the foremost pair of road wheels. 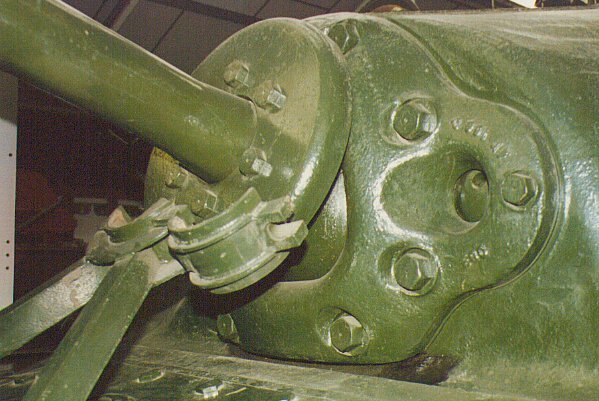 The ammunition for the 32-pdr as used by the Tortoise consisted of a separate shell/shot and propellant charge (unlike that used by the 3.7 anti-aircraft gun). The gunnery reports that I have seen only referred to APCBC but the Tortoise Technical Manual makes reference to HE shells as well. The details given for these HE rounds have not been confirmed as whilst most references books I have acknowledge their existence, they give no details. In addition to the rounds described, some authors have also made reference to APDS and APCR rounds13. H.E. Mk 1 28 lb T.N.T. 257 Mk2/1 Body  buff. Green band on body stamped TNT. Red band or ring of red crosses around nose denote filled and suitable for all climates. Hatched red ring to denote filled and suitable for temperate climates only. APCBC/T Mk1 32 lb. Body  Black with white tip. White, red, white ring around shoulder on the bottom of the ballistic cap. APCBC/T Mk3 31lb. 11oz. 2dr. Whilst visiting the Bovington Library I made a few quick notes on the performance of the 32-pdr taken from the report of the tank trials dated May-July 1948. Preliminary trials gave penetration of Panther armour at 950 yards at 30 degrees. Shot 1 plugged the armour. Shot 2 shot away the lower section of the gun mantlet with the deflected shot lifting the drivers plate 3-4 inches the shot ending up under the turret floor. Shot 3 coincided with a previous round. The observation of shot was said to be better than that of the Centurion and the performance of 32-pdr APCBC being considered better than that of 20-pdr APDS. 3. Defence Committee (Supply), Tank Policy, Joint Memorandum by the Secretary of State for War and the Minister of Supply.